MEMBERS OF THE Callicoon Fire Department proudly march down the street as Jim Schultz, carrying the American flag, leads the way. 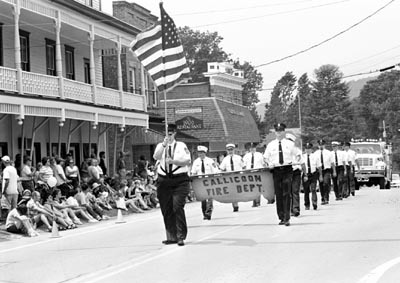 CALLICOON  July 3, 2001  Much to the delight of the scores of spectators and dozens of firemen on hand, it did not rain on their parade Sunday afternoon. A brief, 30-second mist fell just before those marching in the Callicoon Fire Departments Centennial Parade took their first steps down the river hamlets Main Street. Scores of people lined the street to see the proud members of the Callicoon Fire Department lead the parade. They were followed by several other area fire companies along the parade route. Those other companies included Callicoon Center, Cochecton, Hankins/Fremont Center, Horton-ville, Jeffersonville, Lackawaxen Township, Pa., Long Eddy, Narrowsburg, North Branch, Rock Hill, White Lake and Youngsville. Several classic cars and members of the 143rd New York Volunteer Infantry Civil War Re-enactors also participated in the parade. And students from the Hrynko Familys Sullivan West Martial Arts put on a demonstration for the crowd. Navetta and fellow firemen Darren Doetsch, George Gattus and Jeff Jensen served as members of the departments centennial parade committee. Following the parade, several firefighters and parade watchers gathered at the firehouse for refreshments. Navetta noted that the days activities might even help recruitment efforts. Currently, the department has only 21 active members, whereas as recently as the 1960s there was a waiting list to join the volunteer company. But those 21 members are dedicated to protecting and serving those in Callicoon and beyond.